We’d love your help. 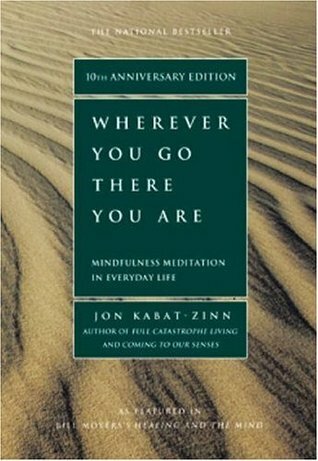 Let us know what’s wrong with this preview of Wherever You Go, There You Are by Jon Kabat-Zinn. In this book, the author maps out a simple path for cultivating mindfulness in one's own life. It speaks both to those coming to meditation for the first time and to longtime practitioners, anyone who cares deeply about reclaiming the richness of his or her moments. To ask other readers questions about Wherever You Go, There You Are, please sign up. Is it somewhat different from The Power Of Now? Thanks. When you first asked me about how to practice meditation (was it last week? ), I gave you a few vague answers and then dismissed it from my mind, thinking that while it is impressive that you consider it seriously, it is not really vital to you right now. But, yesterday when you spoke about how difficult it is to study for more than two hours continuously, I realized that there might be more to it. That conversation set me thinking about a concept called " Digital Natives ". You would definitely qualify to be one. Digital Natives are supposed to have shorter attention spans and a greater propensity to multi-task. They are more at home using technology or entertainment as well as education and even blend the two in exotic mixes. Most of the characteristics of the Digital Natives, like their appetite for knowledge, their openness to stimuli and their connectedness with this world of constant change, are all very positive traits. I too consider myself as a Native, even though, Tarun, who introduced me to the concept would disagree and try to classify me as a Digital Immigrant. Having said all that, we also have to consider if these so-called positive traits might not also have the negative effects that the older generation attributes to it? Could there be a fundamental fleetingness encroaching into our natures? Could small things like it being harder and harder to spend long hours concentrating and a lot of my friends complaining that they can hardly find the energy to read anymore be side-effects of this life-style? What can we do to keep the positive side of this information age and yet not lose our ability to concentrate and to put in focussed effort when required? As I thought of these things, I felt that maybe meditation may indeed be the answer for you and many like you and also to myself. So I spent a few hours researching and browsing about on this and stumbled on this wonderful book about meditation. I kept you and sis in mind as I read this and I think I might have an adaptation of the ideas that might help in our daily lives that might help you enjoy your hours spent studying and also make them more productive as well as longer. I hope you can find the fifteen minutes needed to read this rambling of mine. As I keep telling you, 24 hours is a long time and we all have more than enough time to do more than earn a living and worry about school during a day. We have more than enough time to read, to meditate, to sleep and dream and to take a quiet walk. Shall we start? Think of this present moment as a mirror. A mirror reflecting the past and the future. You have to understand and accept this reflection of yourself in this mirror. You have to be aware of this present moment in all its depth and fullness. Do not judge it. Just know it. See it completely and entirely. Every. Single. Detail. The present moment exists whether you like it or not. Whether it is enjoyable or not. And even if time passes, the mirror stays still. it is always the present moment in which you find yourselves. You cannot change it, you need not judge. You can only understand anad accept it. It just IS. If you can do this, only then will you know what to do next. This practice is called "Mindfulness" and is the core of Meditation. I know the last two paragraphs might have been too abstract for your tastes, but indulge me and read it again please? Don't worry, even though I wrote it, I too don't understand it. Unless we become "Mindful", we may never quite be where we actually are, never quite touch the fullness of our possibilities. Instead, we lock ourselves into a personal fiction that we already know who we are, that we know where we are and where we are going, that we know what is happening - all the while remaining enshrouded in thoughts, fantasies, and impulses. To be "Mindful" is to wake up from this constant ignorance about yourself, your surroundings and your situation. To find your path in life, you will need to pay more attention to this present moment. It is the only time that we have in which to live, grow, feel, and change. The work of waking up from these dreams is the work of Meditation, the systematic cultivation of wakefulness, of present-moment awareness. Meditation is simply about being yourself and knowing something about who that is. It is about coming to realize that you are on a path whether you like it or not, namely, the path that is your life. Meditation may help us see that this path we call our life has direction; that it is always unfolding, moment by moment; and that what happens now, in this moment, influences what happens next. Mindfulness means paying attention in a particular way: on purpose, in the present moment, and non-judgmentally. This kind of attention nurtures greater awareness, clarity, and acceptance of present-moment reality. It is an appreciation for the present moment and the cultivation of an intimate relationship with it through a continual attending to it with care and discernment. It is the direct opposite of taking life for granted. It has to do with waking up and seeing things as they are. In fact, the word "Buddha" simply means one who has awakened to his or her own true nature. All these ordinary thoughts and impulses run through the mind like a coursing river, if not a waterfall. We get caught up in the torrent and it winds up submerging our lives as it carries us to places we may not wish to go and may not even realize we are headed for. Meditation means learning how to get out of this current, sit by its bank and listen to it, learn from it, and then use its energies to guide us rather than to tyrannize us. This process doesn't magically happen by itself. It takes energy. We call the effort to cultivate our ability to be in the present moment "practice" or "meditation practice." I know that you like to sit and meditate. But is it the only way? Not really. You can meditate while sitting, while walking, while standing or while lying down. Once you have some practice, you can even meditate while eating and while bathing and even while studying. That should be the goal. To be able to live every moment with that wakeful awareness called "Mindfulness". How to start then? I know it is hard to start meditating. there is always a hundred other things to do. You could be studying or reading or doing something else. DOING something is SO important. Meditation is the only intentional, systematic human activity which at bottom is about not trying to improve yourself or get anywhere else, but simply to realize where you already are. You have to learn to "Stop". Literally. Just stop doing things. Could you stop wanting to do things? Stop wanting to improve or get somewhere in life? For five minutes? Surely? Once you have accepted this and is ready to meditate, try to ease into it. You may want to go to the next room first, to the drawing room or the kitchen. Then walk slowly and deliberately to the spot you have decided to meditate in. Meditate as you walk. As you approach the spot, stand there for some time. Meditate as you stand. Now, slowly and with dignity sit down. Thich Nhat Hanh once said, "Peace is every step." Sometimes it is very difficult to just sit down. Walking is easier. Try walking formally before or after you sit. Try a period of walking meditation. Keep a continuity of mindfulness between the walking and the sitting. Ten minutes is good, or half an hour. Remember once again that it is not clock time we are concerned with here. The walking is just as good as the sitting. What is important is how you keep your mind. In walking meditation, you attend to the walking itself. Walking meditation can best be done by imagining a river. Imagine that you are a flowing river. Steady and changing, moving in time, but always yourself. Aware of every boulder and every turn. Be aware of every step. Once you have reached the spot, don't abruptly sit down. Remember that we are trying to keep a continuity of mindfulness between the walking and the sitting. Stand still for some time and try to meditate. Standing Meditation is best learned from trees. Imagine yourself to be a tree. Feel your feet developing roots into the ground. Feel your body sway gently, as it always will, just as trees do in a breeze. Sense the tree closest to you. Listen to it, feel its presence. You can try standing like this wherever you find yourself, in the school, in the football ground, by a river, in your living room, or just waiting for the bus. Finally, sit down. But sit down with an intention. Sit with dignity. It helps to come to the bed or to the chair or to the floor with a definite sense of taking your seat. Sitting meditation is different from just sitting down casually somewhere. Sitting down to meditate, our posture talks to us. It makes its own statement. If we slump, it reflects low energy, passivity, a lack of clarity. If we sit ramrod-straight, we are tense, making too much of an effort, trying too hard. To describe the sitting posture, the word that feels the most appropriate is "dignity." If you are told to sit like a king from Lord of the Rings, how would you sit? That is dignity. A Royal Posture. I try to tell this to myself when I sit down to work, or write. To sit with dignity. You should try this while sitting down to study too. It makes a difference in you attitude. When we take our seat in meditation and remind ourselves to sit with dignity, we are coming back to our original worthiness. That in itself is quite a statement. How you hold your hands is also important. that too is a way of making a statement, to yourself, to your mind. The hand positions are called "Mudras" in formal terminology and they embody different attitudes. There is no one right way to keep your hands. You may experiment with different ways yourself in meditation. Try sitting with your hands palms down on your knees. Notice the quality of self-containment here. This posture might feel to you as if you are not looking for anything more, but simply digesting what is. If you then turn both palms up, being mindful as you do it, you may note a change in energy in the body. Sitting this way might embody receptivity, an openness to what is above, to the energy of the heavens. I personally prefer the hands kept together in the lap, with the fingers of one hand lying atop the fingers of the other, the thumb-tips gently touching as if I hold the universe in me. All our hand postures are supposed to be mudras in that they are associated with subtle or not-so-subtle energies. Take the energy of the fist, for instance. Try making a fists as if in anger. Feel the tension, the hatred, the anger, the aggression, and the fear which it contains. Then, in the midst of your anger, as an experiment, try opening your fists and placing the palms together over your heart in the prayer position. This is probably what Gandhiji did when he was assassinated at point-blank range. He put his palms together in this way toward his attacker, uttered his mantra, and died. Now, on to the meditation itself. In Sitting Meditation, the image of a mountain might be most helpful. Imagine yourself to be a mountain, invoking qualities of elevation, massiveness, majesty, unmovingness, rootedness - bring these qualities directly into your posture and attitude. How long should you sit like this? As long as you like, of course. It is quality not quantity that matters. Forming the intention to practice and then seizing a moment - any moment - and encountering it fully in your inward and outward posture, lies at the core of mindfulness. Long and short periods of practice are both equally good. In a line six inches long, there are an infinite number of points, and in a line one inch long there are just as many. Well, then, how many moments are there in fifteen minutes, or five, or ten, or forty-five? It turns out we have plenty of time, if we are willing to hold any moments at all in awareness. Once you are sitting, there are many ways to approach the present moment. All involve paying attention on purpose, non-judgmentally. What varies is what you attend to and how. It is best to keep things simple and start with your breathing, feeling it as it moves in and out. Sit and watch the moments unfold, with no agenda other than to be fully present. Use the breath as an anchor to tether your attention to the present moment. Your thinking mind will drift here and there, depending on the currents and winds moving in the mind until, at some point, the anchor line grows taut and brings you back. This may happen a lot. Bring your attention back to the breath, in all its vividness, every time it wanders. Keep the posture erect but not stiff. Think of yourself as the mountain. Our breathing can help us in capturing our moments. It's surprising that more people don't know about this. After all, the breath is always here, right under our noses. To use your breathing to nurture mindfulness, just tune in to the feeling of it - the feeling of the breath coming into your body and the feeling of the breath leaving your body. That's all. Just feeling the breath. Breathing and knowing that you're breathing. Use your breath to help you to stay in the moment - feeling your own body standing, breathing, being, moment by moment. Thoughts will come up which will pull your attention away. Work with those perceptions, thoughts, feelings and impulses, memories and anticipations. Accept them. Reflect them in the mirror that is the present moment. See them clearly and let them go with the outgoing breath. Toward the end, if you are not particularly attentive, before you know it you'll be off doing something else, with no awareness whatsoever of how the meditation came to an end. The transition will be a blur at best. You can bring mindfulness to this process by being in touch with the thoughts and impulses which tell you it's time to stop. Whether you've been still for an hour or for three minutes, a powerful feeling all of a sudden may say, "This is enough." Or you look at your watch and it's the time you said you would quit. As you recognize such an impulse, breathe with it for a few moments, and ask yourself, "Who has had enough?" Try looking into what is behind the impulse. Is it fatigue, boredom, pain, impatience; or is it just time to stop? Whatever the case, rather than automatically leaping up or moving on, try lingering with whatever arises out of this inquiry, breathing with it for a few moments or even longer, and allowing the moving out of your meditation posture to be as much an object of moment-to-moment awareness as any other moment in the meditation. Bring awareness to how you end your meditations. Don't judge it or yourself in any way. Just observe, and stay in touch with the transition from one thing to the next. You may even do the Standing Meditation and then the Walking Meditation again to end the period of Meditation. Stand up slowly, imagine being a Tree. Become a River and flow out of your room. Go to the balcony, enjoy the breeze as a tree again and then come back refreshed for a fresh day of studying. This technique of learning to transition slowly in and out of things might soon help you to do things that you consider "tasks" to be accomplished more easily. Adopt this attitude before you start your daily exercise, before you sit down to study, before you go jogging, maybe even as you sit down to write the board exams. Let a continuum help you shift gears into things, so that you don;t postpone or cancel them. Also use the technique of examining your intentions when you feel the need to stop an activity. Imagine you are studying, or jogging, or exercising. You feel the need to stop. Ask yourself why. Are you tired? Whatever be the answer, breathe with it a few times. Breathe with this idea that you want to stop. Then continue the activity for some more time. The more your practice this, the more you will find that your attention span is increasing. In time you can extend this feeling of awareness and 'wakefulness' to everyday activities. Start slowly. Take deliberate small steps first. Maybe before you sit down to study? Try to recognize the beauty of the present moment in your daily life. If you are up early in the morning, try going outside and looking (a sustained, mindful, attentive looking) at the stars, at the moon, at the dawning light when it comes. Feel the air, the cold, the warmth. Realize that the world around you is sleeping. Remember when you see the stars that you are looking back in time millions of years. The past is present now and here. Thus, every now and then try Casual Meditation. Stopping, sitting down, and becoming aware of your breathing. It can be for five minutes, or even five seconds. Let go into full acceptance of the present moment, including how you are feeling and what you perceive to be happening. For these moments, don't try to change anything at all, just breathe and let go. Breathe and let be. Give yourself permission to allow this moment to be exactly as it is, and allow yourself to be exactly as you are. Then, when you're ready, move in the direction your heart tells you to go, mindfully and with resolution. Meditation can indeed be done at any time. Take a break from time to time. Maybe during the advertisements of a cricket match, maybe while reaching for a glass of water while eating. Remind yourself: "This is it." Remind yourself that acceptance of the present moment has nothing to do with resignation in the face of what is happening. It simply means a clear acknowledgment that what is happening is happening. Acceptance doesn't tell you what to do. What happens next, what you choose to do, that has to come out of your understanding of this moment. May Meditation help you in the full development of your true potential. It is a way of being, of living life as if it really matters, moment by moment by moment. Make it part of you daily life, rather than merely as a technique or as one more thing you have to do during your already too busy day. The deepest of bows to you for having the courage and perseverance involved in throwing yourself wholeheartedly into this adventure of a lifetime. May every breath you take in mindfulness, in your everyday life, make you smarter, wiser, more compassionate and kinder. Moment by moment, breath by breath. This is supposed to be a practical guide to meditation. It was recommended to me by someone who knew how I feel about the mysticism that surrounds yoga and meditation. Imagine my dismay when I encountered guidelines like "If we can take a stand here, and let go into the full texture of now, we may find that this very moment is worthy of our trust." What? How can you trust or not trust a moment? "In the stillness of formal practice, we do turn our energies inward, only to discover that we contain This is supposed to be a practical guide to meditation. It was recommended to me by someone who knew how I feel about the mysticism that surrounds yoga and meditation. Imagine my dismay when I encountered guidelines like "If we can take a stand here, and let go into the full texture of now, we may find that this very moment is worthy of our trust." What? How can you trust or not trust a moment? "In the stillness of formal practice, we do turn our energies inward, only to discover that we contain the entire world in our own mind and body." Oh so this is how I meditate? I just direct my energies inward and realize I contain the entire world? I have become more midnful of my thoughts and actions, and the amount of time I spend daydreaming or assuming what someone or something else's reality is. Instead, I allow those thoughts to pass quickly, without judgement, and come back to the present, whatever it is I am doing that moment be it playing peek-a-boo with my son, cooking a meal, having a talk with my husband or friend or running a few miles. I think this guy may go down as a historical figure. He was the prime mover in turning meditation into a mainstream, secular, scientifically tested way to rewire your brain for happiness. This is a great book for beginners and the curious. I have been so conflicted on how to rate this book. Its central message is that whatever you focus on now, whatever takes up your time and wherever your thoughts wander, is exactly where you are going in life. It is of little use to idly wish of a future vision for yourself unless you put in the groundwork to making it happen, right now. Despite seeming rather obvious, when put in as so few words as this, I actually found it an extremely enlightening read. The initial section delivered everything I have been so conflicted on how to rate this book. Its central message is that whatever you focus on now, whatever takes up your time and wherever your thoughts wander, is exactly where you are going in life. It is of little use to idly wish of a future vision for yourself unless you put in the groundwork to making it happen, right now. Despite seeming rather obvious, when put in as so few words as this, I actually found it an extremely enlightening read. The initial section delivered everything I desired: it was inspiring, motivating, and yet everything it detailed felt accessible and in-reach, due to the tone used to convey its message. "People who don't understand meditation think that it is some kind of special inner manipulation which will magically shut off these waves to that the mind's surface will be flat, peaceful, and tranquil. But just as you can't put a glass plate on the water to calm the waves, so you can't artificially suppress the waves of your mind, and it is not too smart to try. It will only create more tension and inner struggle, not calmness. That doesn't mean that calmness is unattainable. it's just that it cannot be attained by misguided attempts to suppress the mind's natural activity." Jon Kabat-Zinn also provides tangible steps to improve one's mindfulness, including practicing voluntary simplicity, doing non-doing, focusing on one's breath, appreciating each moment, and more. While these actions might seem a little far-fetched or impractical, Kabat-Zinn writes about them in thoughtful and intelligent ways. He gives practical applications alongside his more theoretical passages, and he also zones in on alternative ways to meditate based on one's specific life circumstances. All of his ideas contribute to the thorough and well-honed quality of Wherever You Go, There You Are overall. "Mindfulness is considered the heart of Buddhist meditation but its essence is universal and of deep practical benefit to all. In essence, mindfulness is about wakefulness. Out minds are such that we are often more asleep than awake to the unique beauty and possibilities of each present moment as it unfolds. While it is in the nature of our mind to go on automatic pilot and lose touch with the only time we actually have to live, to grow, to feel, to love, to learn, to give shape to things, to heal, our mind also holds the deep innate capacity to help us awaken to our moments and use them to advantage for ourselves, for others, and for the world we inhabit. Just as a garden requires attending to if we hope to cultivate flowers and not have it be overrun with weeds, mindfulness also requires regular cultivating. We call the cultivating of our own mind to bring it to wakefulness meditation. The beauty of it is that we carry this garden with us, wherever we go, wherever we are, whenever we remember. It is outside of time as well as in it. In this book, the author maps out a simple path for cultivating mindfulness in one's own life. It speaks both to those coming to meditation for the first time and to longtime practitioners, anyone who cares deeply about reclaiming the richness of his or her moments." I would like to reclaim my moments, to be become fully alive to time and the world. Most of the time I feel lost in a fog, blundering around and crashing into the furniture -- overturning tables and lamps shattering to the floor. The book promises me a road map to a quiet, well-lighted existence. "There is no running away from anything! The romantic notion that if it's no good over here, you have only to go over there and things will be different. If the jobs are no good, change jobs. If this wife is no good, change wives. If this town is no good, change towns. This underlying thinking is the reason for your troubles. You cannot escape yourself, try as you might. Sooner or later, the same problems arise- patterns of seeing, thinking, and behaving. Our lives cease working because we cease "There is no running away from anything! The romantic notion that if it's no good over here, you have only to go over there and things will be different. If the jobs are no good, change jobs. If this wife is no good, change wives. If this town is no good, change towns. This underlying thinking is the reason for your troubles. You cannot escape yourself, try as you might. Sooner or later, the same problems arise- patterns of seeing, thinking, and behaving. Our lives cease working because we cease working at life. We are unwilling to take responsibility for things as they are and to work with our difficulties. It's much easier to find fault, to blame, to believe that what is needed is a change on the outside. There can be no resolution leading to personal growth until the present situation has been faced completely. You must be willing to let life itself become the teacher. There is always something to dislike. When we commit ourselves to paying attention in an open way, without falling prey to our likes and dislikes, opinions and prejudices, projections and expectations, new possiblilties open up and we have a chance to free ourselves from the straitjacket of unconsciousness. Mindfulness is simply the art of onscious living-in the moment." Jon Kabat-Zinn, Ph.D. is the founder and director of the Stress Reduction Clinic at the University of Massachusetts Medical Center and Associate Professor of Medicine in the Division of Preventive and Behavioral Medicine. His clinic was featured on PBS series Healing and the Mind with Bill Moyers. I was recommended this book - but I really struggled with it. The problem might have been increased by the fact that I found a talking book version read by the author. Authors probably should know better. Anyway, it also had lots of that kind of music you might hear while getting a massage. I think that was also a mistake. I just can't imagine myself sitting focused on my own breathing for any length of time - I do get what is being attempted here, but it just isn't me. I also acknowledge that I ha I was recommended this book - but I really struggled with it. The problem might have been increased by the fact that I found a talking book version read by the author. Authors probably should know better. I also acknowledge that I have a range of prejudices associated with this sort of 'practice' (not least based on the sorts of people I have met in the past who are practitioners). I also find that talk of 'mindfulness' and other such notions - 'atonement with the fundamental oneness of the universe' for example - tend to immediately put me off. Just as talk of body postures and energy fields seem hard to take seriously. But what I really struggle with is the implied (well, and explicit) 'spiritualism' of such ideas. My reaction to this sort of thing is, admittedly, over-wrought, but I really have to accept that as a core part of what it is to be McCandless. I think I have decided that I would rather learn concentration by concentrating on something I can also enjoy - music, literature, books - and relaxation from walking, rather than concentrating on my breath. This is like the handbook for mindfulness, a great place for people new to meditation or other contemplative practices to start. It is written in tiny chapters, most useful read alone. In other words there should be a lot of contemplating and meditating on the book itself. There are practical bits on "how" and some thoughts on "why" and specific situations and scenarios to consider. My only beef with Kabat-Zinn is that he has a lot of dangling quotations, where it's like what he's including is s This is like the handbook for mindfulness, a great place for people new to meditation or other contemplative practices to start. It is written in tiny chapters, most useful read alone. In other words there should be a lot of contemplating and meditating on the book itself. There are practical bits on "how" and some thoughts on "why" and specific situations and scenarios to consider. My only beef with Kabat-Zinn is that he has a lot of dangling quotations, where it's like what he's including is so profound that he doesn't feel the need to add to it, explain it, connect it to anything. It kind of fits into his whole persona, and it doesn't render the text difficult, just kind of jagged. To follow his patterns, here are my own dangling quotations. "We are thinking virtually all the time. The incessant steam of thoughts flowing through our minds leaves us very little respite for inner quiet. And we leave precious little room for ourselves anyway just to be, without having to run around doing things all the time." "It helps to have a focus for your attention, an anchor line to tether you to the present moment and to guide you back when the mind wanders... Bringing awareness to our breathing, we remind ourselves that we are here now, so we might as well be fully awake for whatever is already happening." "The practice itself has to become the daily embodiment of your vision and contain what you value most deeply. It doesn't mean trying to change or be different from how you are, calm when you're not feeling calm, or kind when you really feel angry. Rather, it is bearing in mind what is most important to you so that it is not lost or betrayed in the heat and reactivity of a particular moment." I found this in one of those remainder book shops which sell off the unsellable at reduced rates, there I also picked up Pompeii and Cnut, this one did not impress me so favourably. The author notes in a preface that it is his favourite of his own books, I can't see what he sees in it. I found it like a tasting menu in which the feeling grew that the tasting menu itself was denying me the opportunity to enjoy a full meal. When I offered a crumb or a flake of something that was good, the only cer I found this in one of those remainder book shops which sell off the unsellable at reduced rates, there I also picked up Pompeii and Cnut, this one did not impress me so favourably. The author notes in a preface that it is his favourite of his own books, I can't see what he sees in it. I found it like a tasting menu in which the feeling grew that the tasting menu itself was denying me the opportunity to enjoy a full meal. When I offered a crumb or a flake of something that was good, the only certainty was that there would be no more of it. It is divided into three parts, targeting those who maybe are starting or considering starting meditating, then those who have been meditating a while, and thirdly I don't know who or why. Probably me and the book crossed each other several years too late or too early, I much preferred the book I read by Christina Feldman that though I made the mistake of lending to my sister, never lend or loan things that you'd like back - at least that is what I tell the bank, however, they are most unphilosophical. The introduction tells us this book "is meant to provide brief and easy access to the essence of mindfulness meditation and its applications." By "mindfulness" is meant focused awareness of the "present moment." And meditation is "the process by which we go about deepening our attention and awareness, refining them, and putting them to greater practical use in our lives." The book is divided in three parts. Part One, "The Bloom of the Present Moment" seeks to give some background and definitions The introduction tells us this book "is meant to provide brief and easy access to the essence of mindfulness meditation and its applications." By "mindfulness" is meant focused awareness of the "present moment." And meditation is "the process by which we go about deepening our attention and awareness, refining them, and putting them to greater practical use in our lives." The book is divided in three parts. Part One, "The Bloom of the Present Moment" seeks to give some background and definitions. It explains that meditation is "not about making the mind empty or still." Part Two, "The Heart of Practice" delves into the "basic aspects of formal meditation practice." Part Three, "In the Spirit of Mindfulness" "explores a range of applications and perspectives on mindfulness. " If you're looking for something about meditation and mindfulness that's devoid of spiritual interpretations and the like, this is one of the closest approaches I've seen that still focused on the meditation aspect and not just generally being "more aware". It has some helpful suggestions for visualisation, including details not just of picturing things but of feeling things, like his suggestions for standing meditation of imagining yourself as a tree, the part where he mentioned approaching the If you're looking for something about meditation and mindfulness that's devoid of spiritual interpretations and the like, this is one of the closest approaches I've seen that still focused on the meditation aspect and not just generally being "more aware". It has some helpful suggestions for visualisation, including details not just of picturing things but of feeling things, like his suggestions for standing meditation of imagining yourself as a tree, the part where he mentioned approaching the practice with dignity, etc. Overall, I doubt it's going to convince anyone who is highly sceptical to begin with, or help anyone start a practice ex nihilo. But it's worth reading, and sitting with, and thinking about, if you can put aside scepticism and just try it. If I could only have one book, this would be it. Not a novel, but a really great short chaptered book that teaches more than meditation. It asks the big questions about life and incorporates a lot from Thoreau's Walden with quotes and passages. A good mix of Eastern philosohpy and transcendentalism makes this a great book to read a chapter at a time. It will always be by my bedside. This is a peaceful reading. It feels like going to a meditation session with the author. You are invited to bring mindfulness into the now, to practice mountain or lake meditation, to understand that you are connected with the whole, to minimise harm and cultivate generosity, love and patience, and to accept whatever is coming. For the last several decades, as a Professor of Medicine and the founding Executive Director of the Center for Mindfulness in Medicine, Health Care, and Society at the University of Massachusetts Medical School, Jon Kabat-Zinn has been one of the leading pioneers in bringing meditation into mainstream medicine. 1. The Practice of Meditation - Cultivating our mindfulness. 2. Samadhi Muscles - Let’s strengthen them. 3. What’s Your Why? - Gotta have a compelling vision. 4. Practice Every Moment - Not enough just to sit. 5. Becoming Fully Human - That’s the ultimate training. Here’s to embracing our practices that help us most fully plug in so we can shine with an uber-bright radiant enthusiasm that lights up our world. Jon Kabat-Zinn is one of the pioneering medical professionals to integrate east/west practices. This book is a very easy read - yet full of insight and depth. I enjoyed the book immensely due to the luminous knowledge he provides regarding the practice and understanding of meditation and the synthesis of impressions held by various thinkers. I highly recommend this book due to his objective style and candidness, allowing for any faiths, lifestyles, or ages to perceive the truths within. Excerpts: Jon Kabat-Zinn is one of the pioneering medical professionals to integrate east/west practices. This book is a very easy read - yet full of insight and depth. I enjoyed the book immensely due to the luminous knowledge he provides regarding the practice and understanding of meditation and the synthesis of impressions held by various thinkers. I highly recommend this book due to his objective style and candidness, allowing for any faiths, lifestyles, or ages to perceive the truths within. Where ever you go, there seems to be more and more content on mindfulness and meditation. So when I saw this well known title on sale during a Goodreads Daily Deal I picked it up without much thought (haha). I can see why this book has both 5 star and 1 star ratings as it varied for me from chapter to chapter and even page to page. “The phrase “letting go” has to be high in the run Where ever you go, there seems to be more and more content on mindfulness and meditation. So when I saw this well known title on sale during a Goodreads Daily Deal I picked it up without much thought (haha). I can see why this book has both 5 star and 1 star ratings as it varied for me from chapter to chapter and even page to page. Our celebrity worship culture in a nutshell. If interested in what else resonated with me (both good and some bad) check my Kindle Notes and Highlights. Jon Kabat-Zinn is simple, but not easy, to use a title of one of his own chapters on p.5. He can't help it; he writes about mindfulness for intellectual people who expect a man of deep thinking to respect their intelligence and meet them on their level. I personally enjoyed the chapter he has entitled "Stopping". Meditation is about stopping and being being present (p.11). He likes to liken "stopping" to "dying", and I like that. To stop doing is to die, and this brings to my mind what Christ Hi Jon Kabat-Zinn is simple, but not easy, to use a title of one of his own chapters on p.5. He can't help it; he writes about mindfulness for intellectual people who expect a man of deep thinking to respect their intelligence and meet them on their level. I personally enjoyed the chapter he has entitled "Stopping". Meditation is about stopping and being being present (p.11). He likes to liken "stopping" to "dying", and I like that. To stop doing is to die, and this brings to my mind what Christ Himself says about living: Living is dying, and unless a grain of wheat falls to the ground and dies, it remains by itself. To meditate is to stop is to die on purpose to the rush of time when you are still living. By "dying" now in this way, says John Kabat-Zinn, you actually become more alive now. This is what stopping can do (p.12). He recommends us to stop, sit down, and become aware of our breathing once in a while throughout the day. Breathe and let be. Die to having to have anything. My father is a practicing Buddhist. As such, this is the fourth book he has sent me on the subject (in one way or another) about practicing Buddhism. He described this book as Kabat-Zinn's way of introducing "Buddhism without the Buddha," which interested me, as, although Buddhism is most absent of certain things that usually turn me off from organized religion, this book would be a way of looking at the practice of mindfulness through more of a lens of human development instead of religious or My father is a practicing Buddhist. As such, this is the fourth book he has sent me on the subject (in one way or another) about practicing Buddhism. He described this book as Kabat-Zinn's way of introducing "Buddhism without the Buddha," which interested me, as, although Buddhism is most absent of certain things that usually turn me off from organized religion, this book would be a way of looking at the practice of mindfulness through more of a lens of human development instead of religious or soul-centric development. This book, especially part one, framed the practice of mindfulness in such a way that even me, an average white male with an average IQ, could see the advantage of practicing mindfulness and being "present." I have described, to my father, what trying to understand what this practice really is; my metaphor is that it feels like trying to trap a young chicken in an 100 archer cornfield. However, this book made it feel like catching that chicken might be a little easier to do, if you are thinking about it in the right way. Rabat-Zinn does a remarkable job outlining and explaining what mindfulness practice can look like for any given individual looking to work on his or her human development. In part one, he parallels Henry David Thoreau's "Walden" with certain aspects of mindfulness practice, and I found this helpful in understanding the concept of "being present", as I have read "Walden" a few times over in the last ten years. "look at other people and ask yourself if you are really seeing them or just your thoughts about them.... Without knowing it, we are coloring everything, putting our spin on it all." "At the deepest level, there is no giver, no gift, and no recipient... only the universe rearranging itself." "Make a list of what is really important to you. Embody it." "Our ability to touch love and kindness and be touched by them lies buried below our own fears and hurts, below our greed and our hatreds, below our desperate clinging to the illusion that we are separate and alone." I read this book a long time ago --(I had forgotten I read it until my friend, Karen, recommended it to me). I once took a 10 day retreat where the last 2 days were 'silent'. This was one of the books we read. Hm?? Maybe I should own it --read it again? This review has been hidden because it contains spoilers. To view it, click here. Kabat-Zinn's book was filled with everyday ways of cultivating mindfulness and finding peace wherever you might be. It was a very applicable take on meditation and everyday life. Seems a vague description, but once you read the book, it'll seem more spot on. This particular passage summed up what I enjoyed about the book. Its broken down into short, digestible chapters that leave the reader pondering and creating space to implement some of the tips. Wherever You Go, There You Are (Kabat-Zin, J. 1 Kabat-Zinn's book was filled with everyday ways of cultivating mindfulness and finding peace wherever you might be. It was a very applicable take on meditation and everyday life. Seems a vague description, but once you read the book, it'll seem more spot on. Have you ever noticed that there is no running away from anything? That, sooner or later, the things that you don’t want to deal with and try to escape from, or paper over and pretend aren’t there, catch up with you – especially if they have to do with old patterns and fears? The romantic notion is that if it’s no good over here, you have only to go over there and things will be different. If this job is no good, change jobs. If this wife is no good, changes wives. If this town is no good, change towns. If these children are a problem, leave them for other people to look after. The underlying thinking is that the reason for your troubles is outside of you – in the location, in others, in the circumstances. Change the location, change the circumstances, and everything will fall into place; you can start over, have a new beginning. The trouble with this way of seeing is that it conveniently ignores the fact that you carry your head and your heart, and what some would call your “karma,” around with you. You cannot escape yourself, try as you might. And what reason, other than pure wishful thinking, would you have to suspect that things would be different or better somewhere else anyway? Sooner or later, the same problems would arise if in face they stem in large part from your patterns of seeing, thinking, and behaving. Too often, our lives cease working because we cease working at life, because we are unwilling to take responsibility for things as they are, and to work with our difficulties. We don’t understand that it is actually possible to attain clarity, understanding, and transformation right in the middle of what is here and now, however problematic it may be. But it is easier and less threatening to our sense of self to project our involvement in our problems onto other people and the environment. The casualties of this way of looking at things are all over the place. Look virtually anywhere and you will find broken relationships, broken families, broken people – wanderers with no roots, lost, going from this place to that, this job to that, this relationship to that, this idea of salvation to that, in the desperate hope that the right person, the right job, the right place, the right book will make it all better. Or feeling isolated, unlovable and in despair, having given up looking and even making any attempt, however misguided, to find peace of mind. By itself, meditation does not confer immunity from this patter of looking elsewhere for answers and solutions to one’s problems. Sometimes people chronically go from one technique to another, or from teacher to teacher, or tradition to tradition, looking for that special something, that special teaching, that special relationship, that momentary “high” which will open the door to self-understanding and liberation. But this can turn into serious delusion, an unending quest to escape looking at what is closest to home and perhaps most painful. Out of fear and yearning for someone special to help them see clearly, people sometimes fall into unhealthy dependency relationships with meditation teachers, forgetting that no matter how good the teacher, ultimately you have to live the inner work yourself, and that work always comes from the cloth of your own life. So many people even wind up misusing teacher-led mediation retreats as a way to keep afloat in their lives rather than as an extended opportunity to look deeply into themselves. On retreat, in a certain way everything is easy. The bare necessities of living are taken care of. The world makes sense. All I have to do is sit and walk, be mindful, stay in the present, be cooked for and fed by caring staff, listen to the great wisdom that is being put out by people who have worked deeply on themselves and have attained considerable understanding and harmony in their lives, and I will be transformed, inspired to live more fully myself, know how to be in the world, have a better perspective on my own problems. To a large extent, this is all true. Good teachers and long periods of isolated meditation on retreat can be profoundly valuable and healing, if one is willing to look at everything that comes up during a retreat. But there is also the danger, which needs to be looked out for, that retreats can become a retreat from life in the world, and that one’s ‘transformation’ will, in the end, be only skin deep. Perhaps it will last a few days, weeks, or months after the retreat ends, then its back to the same old patter and lack of clarity in relationships, and looking forward to the next retreat, or the next great teacher, or a pilgrimage to Asia, or some other romantic fantasy in which things will deepen or become clearer and you will be a better person. This way of thinking and seeing is an all-too-prevalent trap. There is no successful escaping from yourself in the long run, only transformation. It doesn’t matter whether you are using drugs or medication, alcohol or Club Med, divorce or quitting your present job. There can be no resolution leading to growth until the present situation has been faced completely and you have open to it with mindfulness, allowing the roughness of the situation to sand down your own rough edges. In other words, you must be willing to let life itself become your teacher. This is the path of working where you find yourself, with what is found here and now. This, then, really is it… this place, this relationship, this dilemma, this job. The challenge of mindfulness is to work with the very circumstances that you find yourself in – no matter how unpleasant, how discouraging, how limited, how unending and stuck they may appear to be – and to make sure that you have done everything in your power to use their energies to transform yourself before you decided to cut your losses and move on. It is right here that the real work needs to happen. So, if you think your meditation practice is dull, or no good, or that the conditions aren’t right where you can find yourself, and you think that if only you were in a cave in the Himalayas, or at an Asian monastery, or on a beach in the tropics, or at a retreat in some natural setting, things would be better, your meditation stronger… think again. When you got to your cave, you might get lonely, or want more light, or the roof might drip water on you. If you were on the beach, it might be raining or cold. If you were on retreat, you might not like your teachers, or the food, or your room. There is always something to dislike. So why not let go and admit that you might as well be at home wherever you are. Right in that moment, you touch the core of your being and invite mindfulness to enter and heal. If you understand this, then and only then will the cave, the monastery, the beach, the retreat center, offer up their true richness to you. But so will all other moments and places. Oh... this text is an enormous collection of platitudes. The only useful chapter is the first one - 4 pages - that defines mindfulness and explains it's origin from Taoism and Buddism. Chapters are a few pages long, full of quotes/passages - mainly from Thoreau's Walden, other cited authors include Kabuir, Dalai Lama, some of the Taoist or Buddist masters, well... you get the picture. The author Kabat-Zinn basically repeats the message again with different words and explains why it's a nice mess Oh... this text is an enormous collection of platitudes. The only useful chapter is the first one - 4 pages - that defines mindfulness and explains it's origin from Taoism and Buddism. Chapters are a few pages long, full of quotes/passages - mainly from Thoreau's Walden, other cited authors include Kabuir, Dalai Lama, some of the Taoist or Buddist masters, well... you get the picture. The author Kabat-Zinn basically repeats the message again with different words and explains why it's a nice message. That's all this book really is. Lots of fluff, no substance. There is hardly anything concrete about meditation techniques. If you want to meditate, this is not for you. If you want to understand meditation, this is not for you. If you want to have an idea about meditation, this is not for you. Wherever You Go, There You Are is an excellent introduction to the fundamental principles and thought processes (or lack thereof) involved in mindfulness and meditation. As compared to other books within this space, this book places a greater emphasis on explaining how a formal meditation practice can assist in cultivating mindfulness. Much of the advice is practical and framed through unique metaphors (such as comparing one's being to the characters in a fairytale) that will make certain things Wherever You Go, There You Are is an excellent introduction to the fundamental principles and thought processes (or lack thereof) involved in mindfulness and meditation. As compared to other books within this space, this book places a greater emphasis on explaining how a formal meditation practice can assist in cultivating mindfulness. Much of the advice is practical and framed through unique metaphors (such as comparing one's being to the characters in a fairytale) that will make certain things "click". However, there were several points throughout the book where I felt like I was reading riddles. As direct and practical as some sections of the book are, I found others to be confusing and unrelatable. Perhaps this will be different when I read this book again in a year or two, which I intend to do. As a final note, I thought this was perhaps the best quote in the entire book. Good introduction to mindfulness. I imagine returning to it and getting more from it in repeat readings. That is the message of this book. Kabat-Zinn takes this simple idea and shares simple ways to practice this idea. It's practical. It's gentle. It's easy. It's a book I will read again and again.